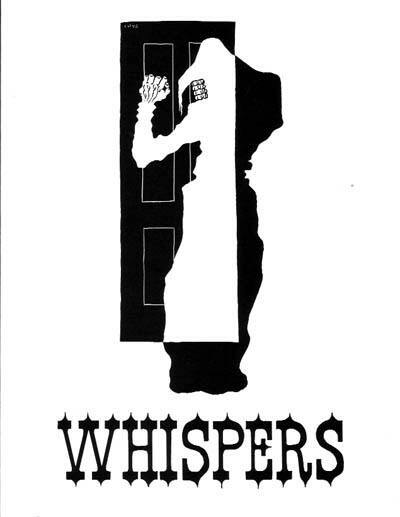 Whispers  ed. Stuart David Schiff (W. Paul Ganley; Buffalo, NY, $6.00, 32pp, quarto s/b, cover by Lee Brown Coye) Bound back-to-back with Weirdbook 30. 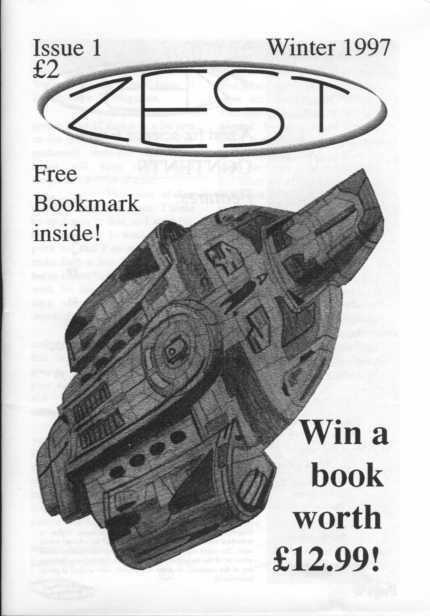 Zest [Issue 1, Winter 1997] ed. Ian Redman (Ian Redman, £2.00, 40pp, A5) Small press SF magazine. Available from Ian Redman, 61 Chilton Grove, YEOVIL, Somerset, BA21 4AW. The Zone and Premonitions [No. 5, Spring 1997] ed. Tony Lee (Pigasus Press, £2.95, 68pp, A4, cover by Roddy Williams) Small press SF fiction magazine. Available from S.A. Publishing, 13 Hazely Combe, Arreton, Isle of Wight, PO30 3AJ. 32 · Freezer Burn · Joe R. Lansdale · ss World Horror Convention 1997 Program Book, Niagra Falls Science Fiction Association, Inc., 1997; a work in progress. Star Trek: Deep Space Nine: Vengeance Dafydd ab Hugh (Pocket 0-671-00468-9, Feb 98 [Jan 98], $6.50, 282pp, pb, cover by Sonia R. Hillios) [Star Trek: Deep Space Nine] Star Trek novelization. Copyrighted by Paramount Pictures. Magic: The Gathering: Planeswalker Lynn Abbey (Wizards of the Coast 0-7869-1182-4, Sep 98, $5.99, 359pp, tp, cover by r. k. post) [Magic: The Gathering: Artifacts Cycle] Novelization based on the fantasy card game, book two in the Artifacts Cycle. Copyrighted by Wizards of the Coast. The Amber Flute of Oz Donald Abbott (Books of Wonder 0-929605-88-8, Oct 98 [Dec 98], $9.95, 118pp, tp, cover by Donald Abbott) [Oz] Childrens fantasy novel set in L. Frank Baums Oz. Illustrated by Abbott. A hardcover limited edition (-89-6) with additional illustrations was announced but not seen. Terminal Frights ed. Kenneth E. Abner, Jr. (Terminal Fright 0-9658135-2-5, Nov 97 [Jan 98], $30.00, 341pp, hc, cover by Wayne Miller) Original anthology of 22 horror stories, each with a brief introduction about the author. Authors include Tom Piccirilli, Peter Crowther, and Yvonne Navarro. Order from Terminal Fright, PO Box 100, Black River NY 13612. The Plague Dogs Richard Adams (Ballantine/Fawcett Columbine 0-449-00071-0, Jul 97 [Feb 98], $12.00, 391pp, tp, cover by John Butler) Reprint (Rex Collings 1977) fantasy novel. This has the 1978 introduction to American readers. Tales from Watership Down Richard Adams (Avon 0-380-72934-2, Mar 98 [Feb 98], $6.99, 335pp, pb, cover by Mike Russell & Anton Stetzko) [Watership Down] Reprint (Hutchinson 1996) collection of 19 stories continuing the anthropomorphic rabbit tales of Watership Down. Bunny collectors should note there are four different covers to this edition. Watership Down Richard Adams (Avon 0-380-00293-0, Mar 98 [Feb 98], $6.99, 485pp, pb, cover by John Lawrence) [Watership Down] Reissue (Rex Collings 1972) novel about talking rabbits. 48th printing. The Ash-Tree Press Annual Macabre 1998 ed. Jack Adrian (Ash-Tree Press 1-899562-62-1, Nov 98 [Dec 98], C$40.00, xv+82pp, hc, cover by Rob Suggs) Anthology of 6 spooky stories by authors not usually associated with the genre, including W. Somerset Maugham, Arthur Ransom, Ford Madox Ford, and Hilaire Belloc. This is a limited edition of 500. A world-wide edition available in the US for $31.00 and in the UK for £19.00. The Red-Eared Ghosts Vivien Alcock (Houghton Mifflin/Sandpiper 0-395-88394-6, Mar 98 [Apr 98], $4.95, 264pp, tp, cover by Barbara McClintock) Reprint (Methuen 1996) young-adult novel of time travel and alternate worlds. The Stonewalkers Vivien Alcock (Houghton Mifflin/Sandpiper 0-395-81652-1, Mar 98 [Apr 98], $4.95, 169pp, tp, cover by Barbara McClintock) Reprint (Methuen 1981) young-adult fantasy novel of statues come to life. The Black Cauldron Lloyd Alexander (Dell Yearling Newbery 0-440-40649-8, Nov 98, $5.50, 229pp, tp) [Chronicles of Prydain] Reissue (Holt, Rinehart & Winston 1965) young-adult fantasy novel, second book of the Chronicles of Prydain. 38th printing. The First Two Lives of Lukas-Kasha Lloyd Alexander (Penguin/Puffin 0-14-130057-4, May 98 [Apr 98], $4.99, 213pp, tp, cover by Brad Weinman) Reprint (Dutton 1978) young-adult fantasy novel. The Town Cats and Other Tales Lloyd Alexander (Penguin/Puffin 0-14-130122-8, Sep 98 [Aug 98], $4.99, 126pp, tp, cover by Mark Buehner) Reprint (Dutton 1977) young-adult collection of eight stories about cats. Illustrated by Laszlo Kubinyi. Sister of the Sky Margaret Allan (Penguin/Onyx 0-451-19040-8, Jan 99 [Nov 98], $6.99, 380pp, pb) Prehistorical novel of ancient Mexico, with fantasy elements. Allan is a pen-name for William Quick. Isaac Asimovs Inferno Roger MacBride Allen (Ace 0-441-00514-4, Mar 98 [Feb 98], $5.99, 304pp, pb, cover by Ralph McQuarrie) [Robot] Reprint (Millennium 1994) SF novel, second book of a series continuing the late Isaac Asimovs Robot series. Packaged and copyrighted by Byron Preiss Visual Publications. Star Wars X-Wing #5: Wraith Squadron Aaron Allston (Bantam Spectra 0-553-57894-4, Feb 98 [Jan 98], $5.99, 403pp, pb, cover by Paul Youll) [Star Wars: X-Wing] Star Wars novelization, fifth in the series based on the computer game based on the movies. Copyrighted by Lucasfilm. Star Wars X-Wing #6: Iron Fist Aaron Allston (Bantam Spectra 0-553-57897-9, Jul 98 [Jun 98], $5.99, pb, cover by Paul Youll) [Star Wars: X-Wing] Star Wars novelization, sixth in the series based on the computer game based on the movies. Copyrighted by Lucasfilm. Vampire Readings: An Annotated Bibliography Patricia Altner (Scarecrow Press 0-8108-3504-5, Oct 98 [Nov 98], $19.50, 161pp, tp) Non-fiction, reference, annotated guide to novels, anthologies, and novellas, with special sections for young adult, and The Unread Undead; indexed by author and title. Order from Scarecrow Press, 4720 Boston Way, Lanham MD 20706; 301-459-3366. Superstition David Ambrose (Warner 0-446-52344-5, Oct 98 [Sep 98], $24.00, 368pp, hc) SF/horror novel about a ghost literally created by the power of the human mind. First US edition (Macmillan UK 1997). The Green Man Kingsley Amis (Academy Chicago 0-89733-220-2, Sep 97 [Jan 98], $12.00, 242pp, tp) Reissue (Cape 1969) mystery set in a haunted inn. A TV tie-in edition. Third printing. Second Sight Beth Amos (HarperPaperbacks 0-06-101288-2, Nov 98 [Oct 98], $6.50, 449pp, pb) Supernatural thriller. A journalist with paranormal abilities investigates a colleagues death. Ai! Pedrito! When Intelligence Goes Wrong Kevin J. Anderson (Bridge 1-57318-121-8, Jun 98, $25.00, 365pp, hc, cover by Peter Green & Mike Manoogian) Associational novelization of a humorous spy story by L. Ron Hubbard. Foreword by Dan Sherman. Copyrighted by L. Ron Hubbard Library. The X-Files: Antibodies Kevin J. Anderson (HarperPrism 0-06-105624-3, May 98 [Apr 98], $6.50, 268pp, pb) [X-Files] Reprint (HarperPrism 1997) novelization, the fifth based on the TV show. Copyrighted by Twentieth Century Fox Film. Ignition Kevin J. Anderson & Doug Beason (Tor 0-812-54548-6, Apr 98 [Mar 98], $6.99, 402pp, pb, cover by Gary Ruddell) Reprint (Coronet 1996) associational space-program thriller.